When you start a new design, you often begin with simple flow schematics while a concept is being refined. Maybe effectivenesses, efficiencies, and other top-level characterizations are good enough to trade between competing concepts at this stage. In later design phases, CAD geometry starts to become available. More mission or usage scenarios need to be evaluated, and often you need to produce thermoelastic load cases for structural evaluations. You have to replace black-box descriptions of components with geometrically detailed models ... often one component at a time! 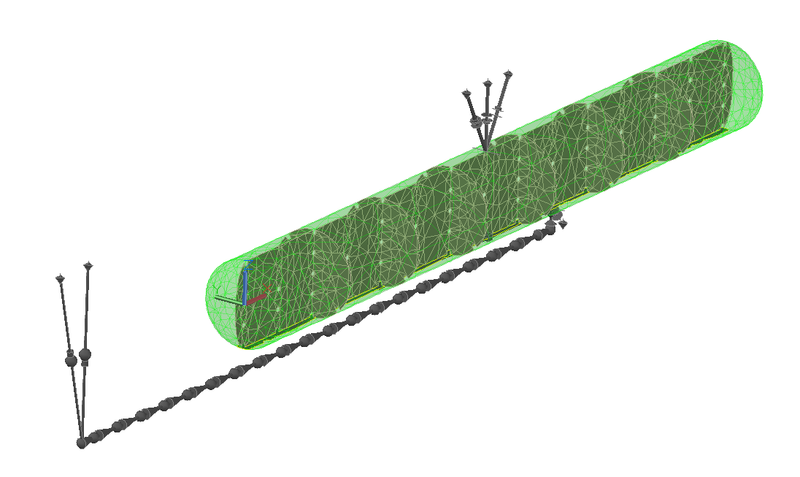 Perhaps a heat exchanger is no longer just assumed to be 95% effective; it must be replaced by a 3D point design with more realistic boundary conditions. Yet the rest of the cycle is still just a top-level schematic. Or perhaps a pump shroud gap is not longer described by just a width and a radius, but rather by FEA models of the rotating impeller and stationary casing. Thermal Desktop and FloCAD are designed to be used at each stage of design. You can work with detailed geometry, notional geometry, or absolutely no geometry ... all within the same model. In other words, you don't change tools in midstream, you just modify your choice of modeling methods within one tool. You can work strictly with non-geometric sketchpad-style flow networks, or you can mix in finite element thermal models of various structions. When you combine 1D flow network modeling with 2D or 3D thermal bodies, you are modeling convective heat transfer between the fluid stream and the arbitrarily complex surfaces and solids. This idea is unique. You don't often find software that lets you rotate a planar schematic around in three-space, too! So to help you understand the possibilities, we've provided a few case studies below. One side (the cathode) of an electrochemical cell has been removed in the picture below, so you can see the internal serpentine passage and the 1D flow network that winds along it. 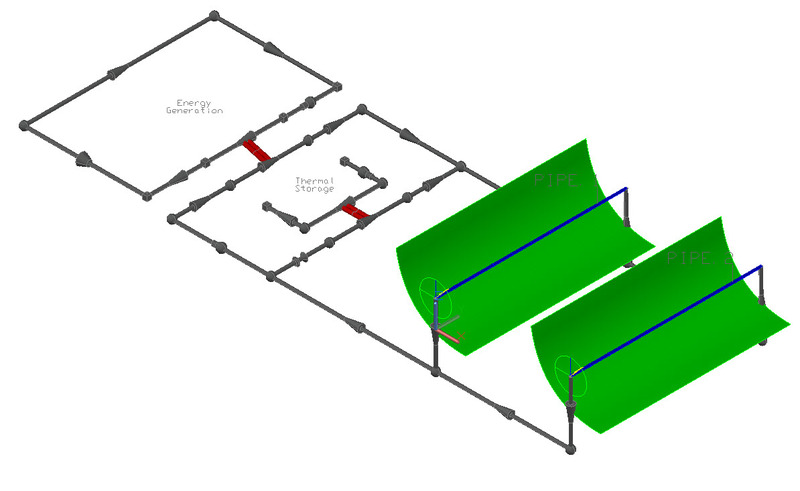 The red-colored rays (FloCAD "ties") connecting the 1D network with finite element wall are shown. The supply and return plumbing for the anolyte at the bottom left. However, the similar supply and return plumbing for the catholyte appears disconnected in space (upper right) because those flow passages have been rendered invisible. These lines are completely non-geometric: their length in the CAD drawing is not related to their actual flow length. This model and documentation of its development may be found here. See also videos of gradients during a day-long discharge/charge/discharge cycle. An LNG train car is shown below. 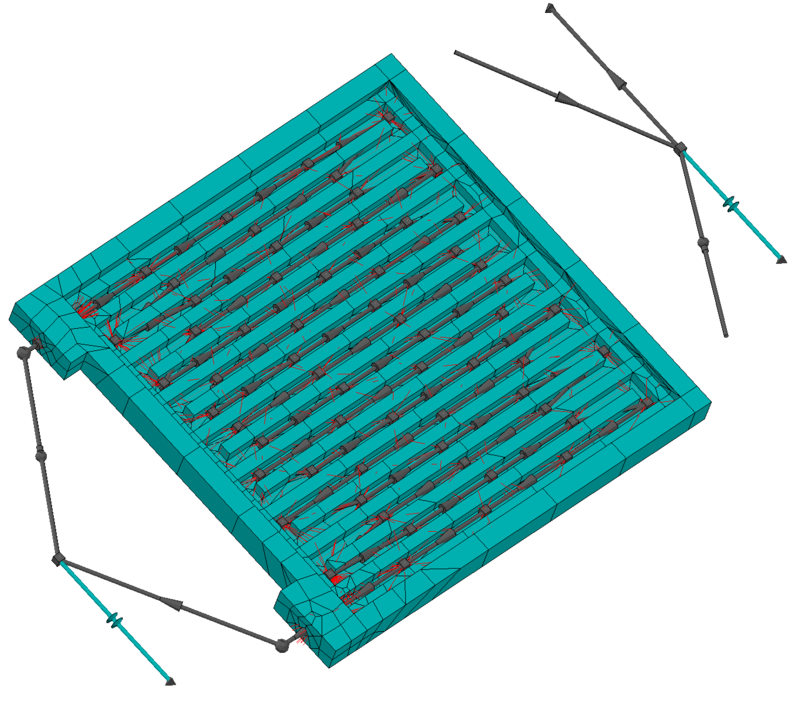 The baffle-filled vessel is represented by a geometric FloCAD Compartment with curved thermal elements used in the FEA surfaces to reduce node counts. The vent and pressurization passages on top of the tank are nongeometric flow networks. Otherwise the valves would be about 2 meters long! A flexible plastic cryogenic hose, which is present only when the car is being filled or drained, is shown below along with simple fill and drain pumps to the left. 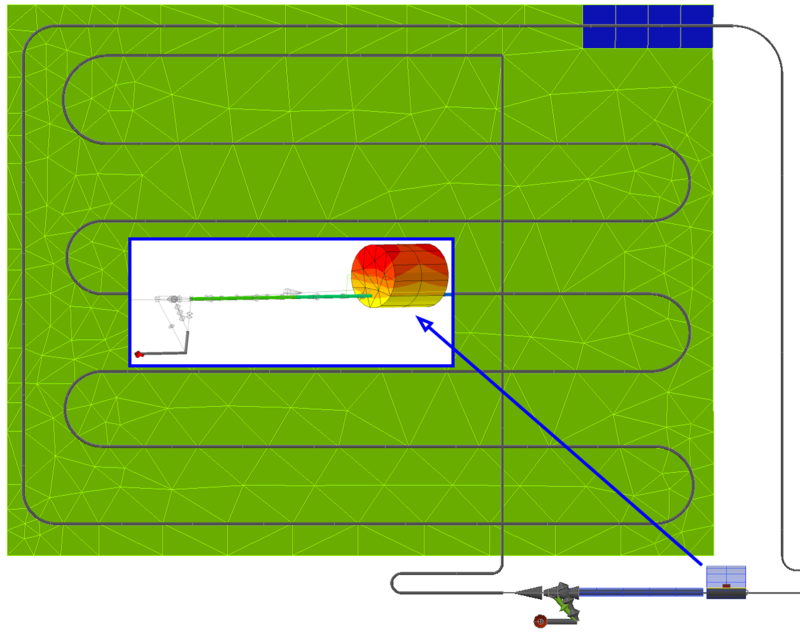 The focus of this model is on the hose chilldown and the tank itself: the fill and vent portions are simple non-geometric boundary conditions. This model and a description may be found here. See also videos of this simulated tank. A loop heat pipe (LHP) radiator is shown below. It is represented using geometric features including imprinting of the centerline using curved elements. While the radiation and attached subcooler and condenser plumbing is geometric, the evaporator assembly (shown below at the right) is nongeometric. The vapor and liquid transport lines could either be geometric or nongeometric: your choice. This evaporator zone is shown again in the inset (at a slightly oblique view). In this inset, you can see that the cylindrical compensation chamber (CC) is also modeled geometrically, even though the evaporator wick and case structure were modeled schematically. In initial design iterations, in fact, the CC was also nongeometric; the CC was a single point in the CAD model that was simply assigned a volume size, rather than a specific shape or orientation. For more information on this model, click here. This video shows the transient start-up of this device. A power generation system using solar concentration collects solar thermal energy and concentrates it on a collection tube containing a fluid. The fluid is passed through heat exchangers to either generate steam for generating electricity or to heat a thermal storage fluid which can be used to generate steam when solar energy is unavailable. The example below shows the solar concentrating troughs, which can be created with a parabolic trough primitive shape or with curved finite elements (for complex shapes). The geometry is used to calculate the amount of solar energy reflected onto the collection tubes. The rest of the fluid system is drawn as a simple nongeometric schematic system, but includes pumps, system-level (effectiveness-based) heat exchangers, turbines, and multi-phase fluids.